Wow, have I been busy! Did you know that there are lots of other dogs that look like me and my brother Eddie? 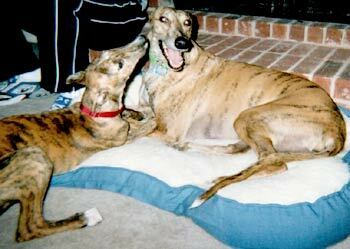 I went walking with the Greyter Dallas Walking Club this past weekend with 9 other greyhounds. We even ran into a whippet who was the same size...I was told that it was a cousin of my breed. I've settled in quite nicely in my new home. I have my very own crate that my mom and dad bring into the family room when they are not home so I ca be in the same room as Eddie. It has a super soft blanket in it. Most of the time, everyone is home so I get to play in the backyard with my boy, too. 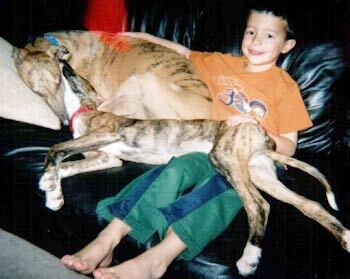 I can almost run as fast as the big greyhound now! I got my puppy shots on March 3rd and I now weigh 33 pounds. I lost lots of teeth and my new ones are really sharp. Dr. Ellis says I'm in great shape and my ears are immaculate (although I don't know what that word means). I get walks through the neighborhood whenever it isn't raining or too cold and all the kids come running up to me to see me. I'm not afraid of cars going by anymore but I still don't like motorcycles. Last week, when it was almost 80 degrees, I got to go to a big park and help feed the ducks. I don't understand why they run away when I want to kiss them...oh well. I am often found sharing bones with Eddie, sharing the couch with Eddie, sharing the dog bed with Eddie - I'm good at sharing. I just don't share my food with Eddie. I've learned to gobble up everything I am given REAL fast - and I'm good at it! Yesterday, I was chasing Eddie and my shoulder collided with the coffee table (who put that there?!). Dr. Ellis said I was fine...most likely a bruise and I need to not play so hard for a week. I'm learning more from my parents (and did you know I have my very own dog trainer, Mary? - she comes to the house just for me!!!). I don't jump on my boy any more and I know "drop it" and "hug". Enjoy the pictures and feel free to call to see me any time!